A starting pitcher at the DBAP had an awful inning and gave up enough runs to lose the game — and he wasn’t wearing a Durham Bulls uniform! Indianapolis’ Radhames Liz is a ten-year veteran who can still throw a 98 mph fastball, but sometimes has problems. Last night’s 4th inning, for example. Taylor Motter popped up to 2B for the first out. J.P. Arencibia walked. Corey Brown walked. Jake Elmore was hit by a pitch to load the bases. New guy Joey Rickard hit a line drive single to left to drive in Arencebia. Hak-Ju Lee hit a sacrifice fly to center field that scored Brown. With Elmore on 3rd base and Rickard on 1st base the Indians left fielder dropped Luke Maile’s fly ball right in front of the video board and Elmore scored. Liz then walked Boog Powell to load the bases again, but Desmond Jennings grounded out to end inning (note for Rays fans: second time this rehab stint that Jennings has made a bases-loaded out). Three runs on one hit! It says something for Liz’s erratic nature that he finished his night pitching two more innings with seven straight outs: A ground out (Jennings), a liner to left, two K’s, a ground out, and two more K’s. Fastballs were still in the 95-98 mph range after 90 pitches. For trivia fans, last night’s two hit win matches one from way back on May 13th that the Bulls won 1-0. Lots of folks go to Bulls games whether they are home or elsewhere. 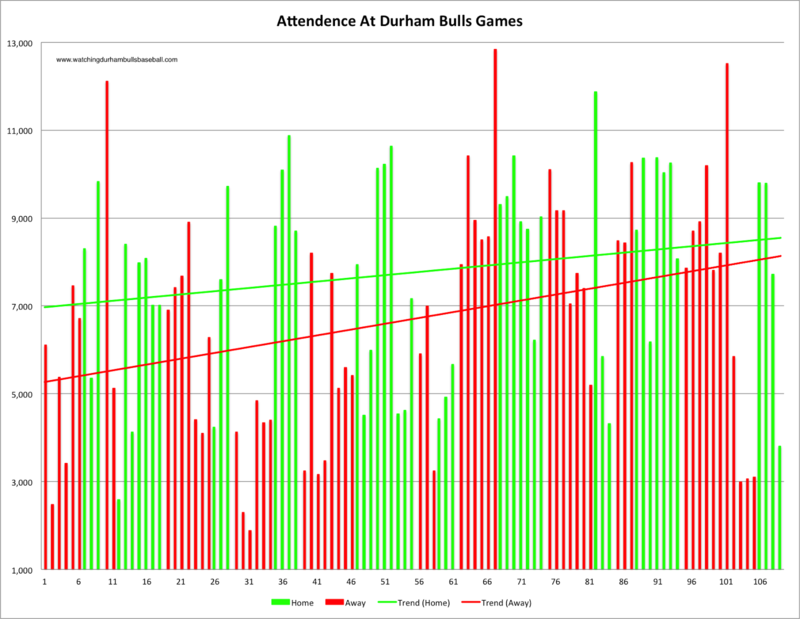 The Bulls average 7,776 at home and are averaging 6,676 as a draw while on the road. Although some might say that the away games are possibly not all that good a measure of how much of a draw the most famous team in minor league baseball can be. Last night (a Monday) was one of the smaller crowds this year and still fun. 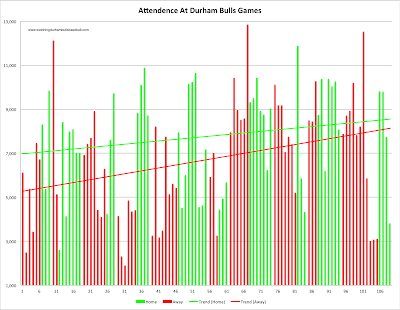 Buffalo back in May and Gwinnett just last week appear to be the sites where the Bulls are the least popular. Although it's entirely possible that it's the Bisons and the Braves who aren't popular.